Phoenix Landing operates an adoption program which covers the Washington D.C. region, Maryland, Virginia, North Carolina and Northeast Florida/Jacksonville. We are also happy to work with people that live in surrounding areas if you are willing to join us for a core class at one of our regular event locations. Most parrots require a succession of homes because they should live a long time. We strive to find the best possible home for every bird in need. If you can offer a parrot a safe and loving environment, good nutrition, and a family to call its flock - then we would like to hear from you. Your patience and compassion may be required depending on each circumstance, but every bird is truly worthwhile and special, and there is always a home for every bird. We are always in search of nurturing and experienced people to provide foster care support on a regular basis as well - people we can count on to help a bird temporarily until a more permanent home can be found. 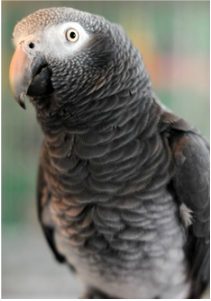 If you are at a time in your life when it is not possible to give a parrot a long-term home, fostering may be a great option for you and the parrots who often quickly need our help. Our adoptable birds are not portrayed here, however parrots come to us from the best and worst of situations. We have hundreds of birds in foster, from parakeets to macaws. Our coordinators will work with you to find the best species and personality for your home. Please think first about the needs of parrots. What kind of bird will work well with your family, schedule and capabilities? Understanding the attributes of various parrot species is important. It is also essential to make sure that the personal connection between each individual parrot and the adopting family is just right. We want our families and birds to succeed for many years. The first step is to send an application, begin talking with us, and attend our educational seminars. Our goal is to help each parrot find stability and the best possible place to call home. SOME of our parrots are listed on PetFinders, Adopt-A-Pet and other adoption sites. However, it is very important that you not apply for just one specific bird. Let us work with you to make the best match for every bird in our care. Thanks for considering adoption first and for Helping Parrots!! Download in Word or PDF. Please follow the instructions on the application about how to mail or e-mail it to us. We want to set you and a bird up for success, this is why in most cases we prefer to do a home visit. This usually happens after you join us for a class, and before a bird is placed. Here is some information about Why, Who, When, and What to expect. when a Phoenix Landing bird enters your care. These are posted for your information only.